Highlights from the third round of the AT&T Pebble Beach Pro-Am in California. 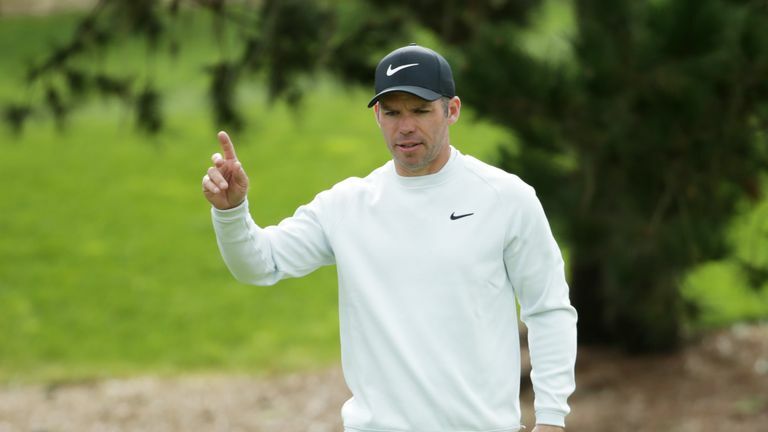 Paul Casey will take a three-shot lead into the final round of the AT&T Pebble Beach Pro-Am, with four-time winner Phil Mickelson his closest challenger. Casey fired a five-under 67 in blustery conditions at Spyglass Hill, one of three courses used, with the Englishman mixing six birdies with a sole bogey to get to 15 under. Mickelson posted a two-under 70 on Pebble Beach to move into outright second, with Lucas Grover a further stroke back in tied-third after three-putting the final hole of his third-round 71 at Monterey Peninsula. "I actually thought it was a successful round," Mickelson said. "It was difficult out there. I've got a good chance going into tomorrow." Casey - starting tied for the lead - birdied the fourth but failed to get up and down from a greenside bunker to save par at the sixth, before picking up a shot at the par-five seventh and rolling in a 12-footer at the ninth. Reaching the turn in 34, Casey pitched to tap-in range at the 11th and followed a 10-foot gain at the 14th with a birdie-two at the next on his way to setting the clubhouse target. Mickelson lost ground after missing an eight-footer to save par at the first and found himself over par for the round when he posted back-to-back bogeys around the turn. The veteran came back with a close-range gain at the 13th and eagled the next after firing a stunning approach to three feet at the par-five next, although was unable to convert from 12 feet for a closing birdie. Former US Open champion Glover moved up the leaderboard with four consecutive birdies, only to register a three-putt bogey at the fifth and do the same again at the ninth - his final hole - to join Scott Piercy on 11 under. Brian Gay and Matt Every sit five strokes off the pace in fifth spot, with Jason Day and Scotland's Russell Knox part of the group a further shot back. Internet sensation Ho Sung Choi, famed for his unusual swing, saw his PGA Tour debut end in a missed cut after a five-over 77 at Pebble Beach, the course used for Sunday's final round. Who will win the AT&T Pebble Beach Pro-Am? Watch the final round live on Sunday from 6pm on Sky Sports Golf and 10pm on Sky Sports Main Event.